Hardware What is the best 400-599W PSU? Discussion in 'Article Discussion' started by arcticstoat, 13 Sep 2011. We put nine mid-range PSUs to the the test to see which is most worthy of your cash. And given the price range of £30ish to £110 ish I can't help feel there are a lot of PSUs missed out that I'd like to have seen included. But very nice to see a round up of any kind from BT . Nice review, guys. My only criticism is that the graphs on Page 11 (12V rail test) might benefit from either additional labels on the Y-axis or separate colors to differentiate the 12V rails. As it is, according to the legend every rail is identified by the same blue color. I'm pretty certain that my assumption is correct, and that the graph is read from top to bottom (i.e. 12V1 is at the top, then 12V1, 12V2, etc.). However, in the interest of clarity it would have been nice to see the rail designations along the Y-axis instead of the power supply model, which is already identified in the graph header. 1) No fan noise level comparison charts. A really big part of a power supply's quality is how much noise it makes at different load levels (e.g. 50% and 100%). 2) No overload tests. The point of this is to see exactly how much can be pulled from the PSU over its rated wattage, and how the PSU reacts to being overloaded - i.e. are its protections fully functional. It's a pretty big no-no if a PSU sparks up when overloaded, as opposed to simply shutting down without endangering the components. That's much more like it! Good roundups are immensely useful and this price-range is a smart one to test. Introductory text to explain concepts and testing methodologies, summary on each product tested; graphs, performance results and individual product scores - That's what I expect from bit-tech and please let it continue. Some of the scores are a bit odd (75% for a PSU that one should leave on the shelf because of only just meeting the ATX spec?!) and the lack of a conclusion is odd too; but then again the results are clear and speak for themselves so I don't really have a problem with that. The results from the Seasonic go to show why we so often see Seasonic PSUs recommended by people in the know. I've been using a Corsair CX430 in one of my builds here and I confirm that it's a nice, quiet PSU. It doesn't get any heavy loads in my usage, but it's nice to see the touted reliability & quality of Corsair's PSUs confirmed in testing. I made my own conclusion. Corsair wins! On a price to performance basis anyway. We'd love to do sound pressure tests, but most of the meters aren't sensitive (sub 20dBA) to measure PC components and the ones that are cost and arm and a leg. Plus, as the Chroma load tester (and its PSU) make a ton of noise, all the meter would be listening to is them, not the PSU. Very nice review. Would have liked a chart comparing the amps on the 12v rail for convenience but otherwise a really helpful review. Please see my answer to this question, also asked by bigkingfun. The reviews do however tell you of our observations about how noisy each PSU is at different load levels. Frankly, given how many PSUs still don't do what they claim do on the label, we're more concerned about how PSUs behave at their stated level at the moment, let alone what they may do when overloaded. Unless you're running multiple grunty GPUs and an overclocked CPU along with an impressive bank of HDDs, you'd be hard pressed to draw more than a couple of hundred watts peak. 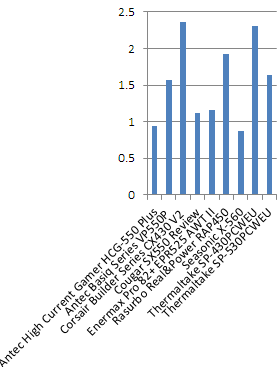 The 'required PSU wattage' ratings listed by Intel, Nvidia and AMD are hugely overestimated, probably to counter the fact that common el-cheapo power supplies can only supply their rated wattage for a fraction of a second before catching fire, so this give them a large buffer to prevent angry consumers who bought a £10 '500W' supply from complaining. With a half-decent brand-name supply that can support it's rated capacity indefinitely (and can peak to quite a lot more for a few seconds at a time) you can easily get away with half the 'required' supply power, maybe even less if you don't intent to be running Prime95 for 24 hours a day. e.g. under load, my relatively modest rig (e8400, gtx460) draws a little over 200W running full-pelt. Going by manufacturers 'minimum system power' ratings, I should need at least 450W! Given that all of the power supplies in this comparison well perfectly able to output their rated wattage, I hardly see this as a valid point. Fair enough regarding the dBa tests though. ps: Could be nice to have a noise comparison at idle and load, but that is not the most important. On the last graph of page 12, the Antec High Current Gamer HCG-550 Plus shows a + 11.94 v on the -12v rail. I am assuming this is a typo. The Seasonic X series is impressive. If my machine didn't require more than 600w, I would be tempted to buy it. Interesting piece - would be great to know what your test rig was set up to. To test each PSU, we programmed the load testers to drain the amount of power that each manufacturer claims its PSU can deliver. The voltage of each rail was measured at 10, 50 and 100 per cent load to determine if it was within the ATX spec. We then left each PSU running at 100 per cent load for 15 minutes to see if it could produce stable voltages over an extended period.